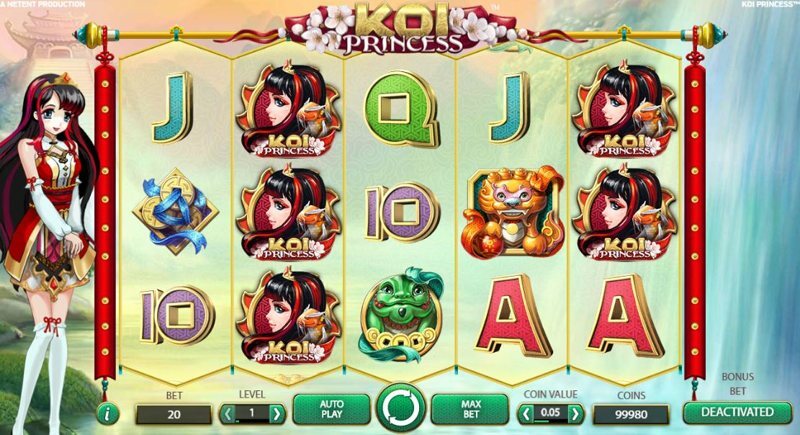 Koi Princess is a Japanese-inspired Video Slot from Net Entertainment, that uses one of the most cultural, historic icons from the orient; fish! The game uses 5 reels, and 20-pay lines, and you can spin from as little as £0.20, to £200, ensuring all players can play at a stake that’s affordable to them. While Koi Princess doesn’t feature the most up-to-date or state-of-the-art designs, it’s simple, and it works; Net Entertainment have clearly tried to create a recognizable Japanese environment within the game, and from the Japanese writing, to the musical sounds, everything fits in well with the Asian culture. There’s a ton of features, random events, and bonuses in Koi Princess, and it’s one of the reasons the games become so popular. Below, we’ll look at the bonuses and features you’ll find, as well as explaining as the “Bonus Bet”, which confuses many new players. Koi Princess sounds a little confusing, but once you get the hang of it, it’s a great laugh to play, and while it’s a low-variance slot, the features are triggered often, ensuring you don’t endure long, boring sessions with no wins, or action. Before you start playing, you’ll see a button on the bottom-right-hand-side of the game screen, called “Bonus Bet”. By default, this button is toggled to the “off” position. If you decide to play with the bonus bet active, you’ll need to click this button. 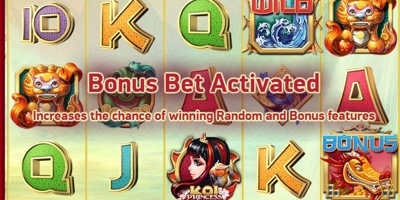 In doing so, your stake will double, without the payouts increasing, however; activating the bonus bet greatly increases the chance of landing the bonus, as well as the base-game random features, and it’s generally recommended you do play with it on. 5-Hit – A wheel spins, before landing on a random symbol. You then return to the spin, and are guaranteed at least one 5-of-a-kind pay line, with this symbol. Fish Wilds – A fish will appear at the right-hand-side of the screen, and spit anywhere from 4, to 9 wild symbols onto the reels, which stick in place for the spin. Wild Reels – Pick this, and a fish will swim back and forth across your screen, making anywhere from one, to 4 reels completely wild. Bonus Entry – If you pick the bonus symbol, you’ll simply win entry into the bonus, explained below. Coin Win – Yes, yes – Net Entertainment haaaad to do it. Pick the coin win, and you’ll win 20X your stake; not the worst win in the world, but disappointing, regardless. No-Win-Free-Spins – Many players number one pick, the no-win-free-spins initially awards you with 10 free-spins. Each spin, you’re guaranteed to win, and if no winning pay lines are made on the reels, the amount shown below the reels will be added to your balance. This amount initially starts at 1X your stake, but here’s where it gets interesting. Every time you spin the reels, and win more than what’s currently set as the guaranteed prize, you’ll be awarded one more free spin, and the amount you win, then becomes the minimum for the remainder of the spins. For example, if you, on the first spin, won £100, every other spin you’d be guaranteed to win £100 or more. Wild Reel Free Spins – If you’re awarded the wild reel free spins (generally the hardest bonus to win), you’ll be given 10 free-spins, with each spin enjoying random wild reels.